Welcome everyone, to the Onmyoji Tips and Tricks guide. 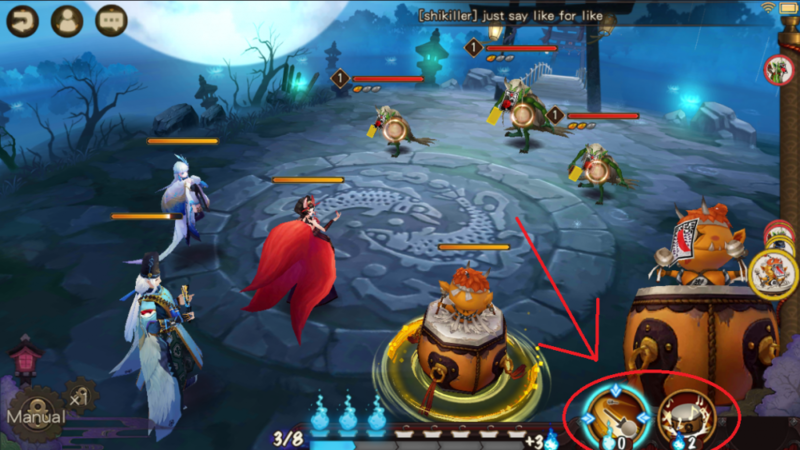 This guide is designed to help you understand the basics of Onmyoji and give you some helpful tips to further yourself in the game. Onmyoji is a turn-based RPG game where you take control of a summoner who fights alongside a group of summoned creatures. Onmyoji takes place in a world of humans and demons pulling a lot of Japanese mythology. You can summon creatures known as Shikigami to help you fight all of which have different forms. The Shikigami are the game’s version of collectible characters. You’ll be spending a lot of time through the game trying to collecting Shikigami through summoning pulls in order to make your team better. There are tons of different Shikigami in Onmyoji, each one with their own design, skills, and stats. 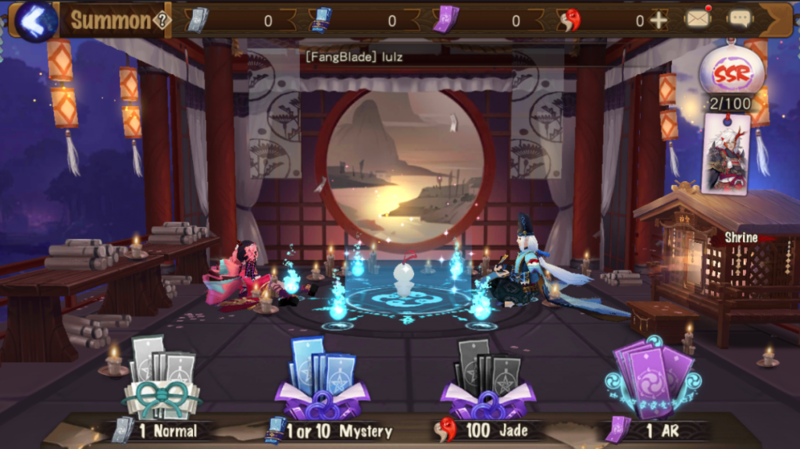 To summon Shikigami you have to get Jade, the in-game currency that can be bought or earned through playing the game. Jade buys you summoning tickets where you can pull new Shikigami from. The tickets themselves are actually a neat mini-game where you have to draw a pentagram on the ticket with the touchscreen. It’s a fun little addition to just tapping a button and watching an animation. Onmyoji is a story heavy game and it has a very well written one at that. The presentation of the game is fantastic with the art style pleasing to look at and the audio is incredible. You’ll be following through the story for the majority of the game and for anyone who loves long-term RPG’s this game is a definite must play in the mobile market. There are essentially two modes in this game, story mode where you walk around, talk to NPC, enjoy the story, and the battle mode where you engage in combat. 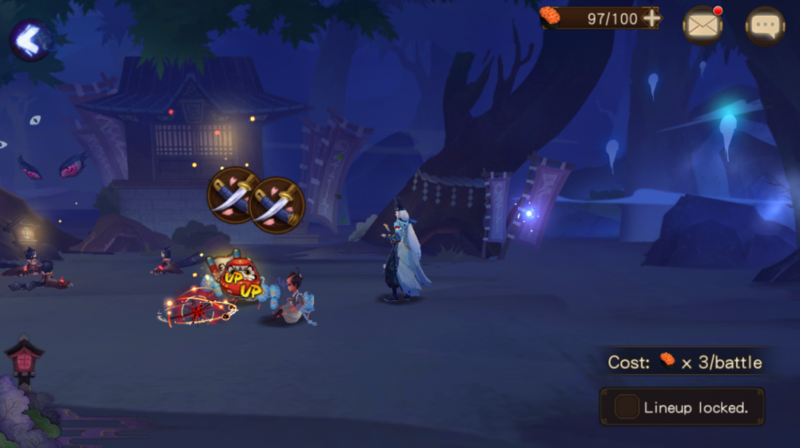 The combat in Onmyoji is a turn-based system centered around your summoner and Shikigami. Depending on the kind of fight the map set up can be somewhat different. Typically your party will be on one side of the screen while the enemies are on the opposite. But in some cases, the enemy could be in the center of the stage with your party surrounding them at different points. It adds a unique touch to the classic RPG combat style, giving different vantage points to attack from depending on where the enemy is. In battle, all characters have their own attacks and skills that they can use. Every character has a basic attack that costs nothing to use. So any character can attack every turn and use that as their base move. Aside from basic attacks, each character has their own skills. Some can do damage, some can heal, others can buff characters making them stronger. It’s all depending on the kind of Shikigami you have in your party. 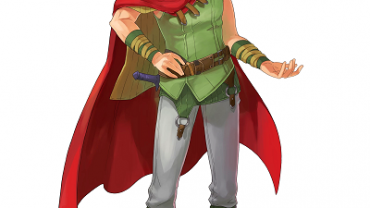 You’ll want to build your party based on your play style whether you want one unit to be your main attacker while everyone else just heals and buffs. Or have a party full of powerful units that trade-off using magic skills. The main point to focus on when building your team is the cooldown cost of skills. Most skills have a cooldown that you have to sit through once used. A cooldown is a specific number of turns that have to go by before you can use that skill again. This is important when doing combat in Onmyoji because it directly affects every unit in your party. For every unit cooldown is different, it’s all based on the skills they have. 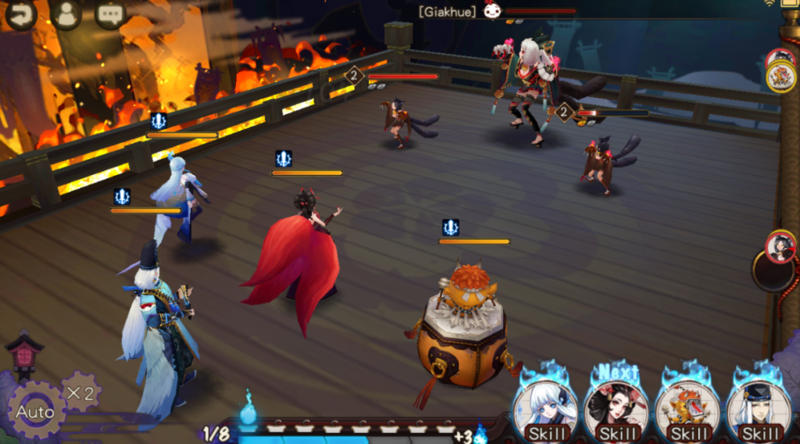 In the early game, team composition and strategy isn’t very apparent but as it gets more difficult and your roster of Shikigami grows you’ll be spending more time focusing on team building and strategizing. Another interesting thing about Onmyoji is the way it handles it’s story’s chapters and engaging combat. Every chapter that is unlocked has an exploration mode where you walk around a small area full of enemies just sitting on the map. You can actively choose what enemies you want to encounter instead of just being thrown into them randomly. And each enemy has a little floating icon around them that determines certain buffs to your party if you win the fight. So being able to pick and choose enemies gives a sort of control to how you want to progress in the game. You can choose to fight an enemy that gives you an EXP boost first then handle all the others afterward getting boosted EXP from the first one. In each area, there is an objective you have to complete in order to make the boss appear. Once you complete it the boss will show up and you’ll be free to fight them. Bosses are just like normal enemies only with higher stats. So they take more hits, deal more damage, and are generally just harder to bring down. But when you beat them they give better rewards and help progress the story. Onmyoji is a great take on RPG’s for the mobile market and brings something new and unique to the table.